I just recently made a gallon of Cortido this week and I realized that I’ve mentioned my Latin American Sauerkraut several times, but haven’t shared the recipe… My bad. Let me share a little information before I share the recipe. This delicious spicy condiment is ‘perfecto’ with Mexican and Latin American food of all types. It is traditionally made with pineapple vinegar but can be prepared with whey and salt. I’ve made pineapple vinegar with good success (will share later), but didn’t really like the ‘traditional cortido’. I really like the way I’ve been making my LAK. I’ve add a couple things to make it tastier… so here’s my version of the recipe. Also, like traditional kraut, cortido improves with age. Yummm! 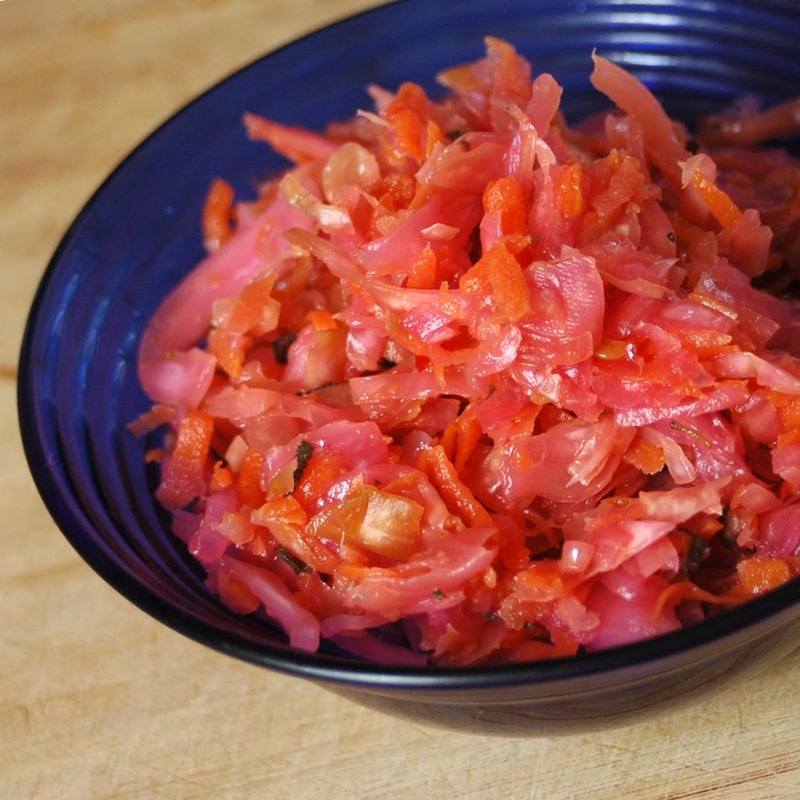 You can find this recipe in Nourishing Traditions and read here if you are wondering what’s so great about lacto-fermented food. In a large bowl mix cabbage with carrots, onions, garlic, oregano, red chile flakes, sea salt and whey. Pound with a wooden pounder (check out my pictures) or a meat hammer for about 10 minutes to release juices. Place in mason jar and press down firmly with the pounder until juices come to the top of the cabbage. The top of the cabbage mixture should be at least 1 inch from the top. Cover tightly and keep at room temperature for about 3 days before transferring to cold storage. *if you don’t have whey… use an additional 1 Tbsp of sea salt. I do not like going this route as the flavor is very different. The whey seems to impart a great flavor that sea salt doesn’t give, but some people like this… so try it both ways and see what you like. NOTE: This might produce more than 2 quarts… I usually get about a gallon out of this recipe. So, if you want a smaller option… get a smaller cabbage and use less carrots and onions, but keep the salt and whey the same. Honestly, I don’t measure anything except the whey and salt. I just grap, chop, shred and grate what I have, throw it all together and pound away. Once you’ve done it a few times… you’ll feel more comfortable to just eyeball everything. That’s what I love about making lacto-fermented food, you don’t have to measure everything exactly to get great results. Like I said… once you’ve done it a few times… you’ll understand what I mean. i was going to ask if you had a recipe for cortido, this sounds nice and simple. thanks! I just found your blog through Kitchen Stewardship and have a question. I cannot eat raw onions due to the fact that they cause migraines for me. Do you know if fermenting them like in this recipe would balance out that effect? Hello Leah! Glad to meet you here! I am not sure if fermenting would help eliminate that affect. I almost want to say yes because fermenting veggies usually makes it more digestible and eliminates the things that usually causes irritation. Like cabbage, my hubby can’t eat too much unfermented cabbage because it affects his thyroids, but he has zero problems with my cortidos and other fermented cabbage mixtures. I would say… give it a try and see what happens! Make a quart of it and see if it bothers you. I know you don’t want to be knocked out by a migraine… I don’t want you to be! But you’ll never know till you try. You can always make this without the onions. It’ll have a different taste, but it will still be delicious! PLEASE please let me know how it goes!! Thanks so much for stopping by! I am eager to try this recipe-good thing I planned to go to the market today! I’m putting some green cabbage on my list :~)This will be first foray in to fermenting vegetables-I’m so excited! I tried it with the onions and NO MIGRAINE! YAY! This is so awesome for me. I figure it probably did some breakdown of the enzyme that causes the migraines. This was so good. My little even ate it with me although I got that face at first like what she normally gets when she tries new foods. Leah! Awesome! I am so glad for you. Don’t you just love how the fermentation process really brings great benefits?? LOL! I know what you mean about the “face”, but keep giving it to her and she will learn to love it. My girls love it and often eat it for a snack or when their bodies crave it. I know it’s been over 3 years since the last comment so this may go unnoticed, but have you tried doing this with tomatoes in it or would that become squishy? Also, could you add peppers and cilantro? Hello Candace! Wow, it has been that long?! LOL! Again, you will just need to try it out!! You can make this recipe and divide it up into quart size jars and add one with tomato, another with cilantro and pepper. I would totally do that! Please let me know how the experiment goes!! Would love to know what you think 🙂 Enjoy! I tried both with and without the tomato and would definitely say DON’T ADD TOMATO! That is, unless you like your cortido to be covered in a layer of slimy mush 😛 As they fermented they completely lost their shape and texture. It came out great with peppers. I added both red bell peppers and jalapenos and in place of the oregano used a LOT of fresh cilantro (can’t get enough of it) and also removed the carrots. I put a little bit of cumin and tumeric in as well and it did interesting things to the color. Everything was yellow/orange tinged but tasted great. I usually like to make a gallon or two and it has last us about a 2 months stored in the fridge or cool dark place after it goes through its fermenting stage.